TeacherDance: Visiting - Two Places At Once! Yes, HURRAH! I'm on my way to the All-Write Conference in Warsaw, Indiana, to meet a whole bunch of friends, and some new ones too, all through blogging. We will have some sweet reunions and some terrific learning, too. And, while I'm traveling, I'm visiting Michelle Barnes on her website, Today's Little Ditty with a new poem. Each month, Michelle has a guest poet whom she interviews and who also offers a poetic challenge. 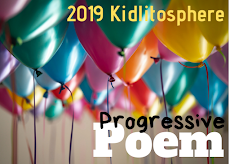 This time the poet is Corey Rosen Schwartz who has given the challenge to write a stanza or two about building a treehouse, using unpredictable rhymes of more than one syllable. Michelle's wonderful interview and post about this is here. Please visit to read my poem about a mouse's wish and a treehouse, and then visit those other poets who've written poems, too. Thanks for featuring my poem, Michelle! Enjoy All Write! It sounds like an amazing conference. I'll be looking for your learning soon. I love how the connections made through blogging become face to face! Thanks, Julieanne, it'll be quite a wonderful time, & I will be sure to share! How much fun for you to be meeting up with friends! Happy learning! Thanks, Loralee. Watch for the tweets! Enjoy your conference, Linda! Pretty impressive trick, being in two places at once. Some day you'll have to let me in on your time travel tips! Ha-promise! Am in Atlanta now-waiting for next flight-people watching! Envious of your All Write trip. Have fun! Thank you-here now, a fun day! What fun the treehouse mouse! Glad you had such a good trip to All Write. I look forward to hearing more about it--loved the pictures the Slicers shared! I loved doing a mouse theme with my first graders each December, and making mouse houses out of shoeboxes...Now a treehouse mouse house would have been great fun to do with them! I loved your poem!